Doug Allshouse has been writing his seasonal Mountain Journal for many years. It appears in the quarterly newsletters of the Yerba Buena Chapter of the California Native Plant Society (CNPS). We are very pleased to share his seasonal reflections on the natural history of the Mountain. Together with David Nelson, he is writing "The Natural History of the San Bruno Mountains", a long-needed and detailed natural history of the Mountain. The book will be published by the California Native Plant Society. As the end of the annual rainfall-season was nearing, June 30, the anxiety of reaching the 3-foot mark increased dramatically. Thanks to a small one-day storm and 7 foggy nights we surpassed the magic mark with 36.22 inches in the books on 117 days of precipitation. The 2013-14 season was our last dreadfully dry year, 13.85 inches on just 40 wet days. The past three seasons have averaged 27.34 inches on 84 wet days. An average year of rainfall for San Bruno Mountain is 20-24 inches. A lot of rain evidently meant a whole lot of mice and voles this year. It seemed you couldn’t take five steps on a trail without seeing a vole or a mouse scurrying to shelter. One of the most frustrating feelings is reading or hearing that a plant exists on the Mountain and not being able to find it. One that was avoiding me was bladder parsnip, Lomatium utriculatum, a plant with an umbel of many tiny lemon-yellow flowers with a leaf on the stem. 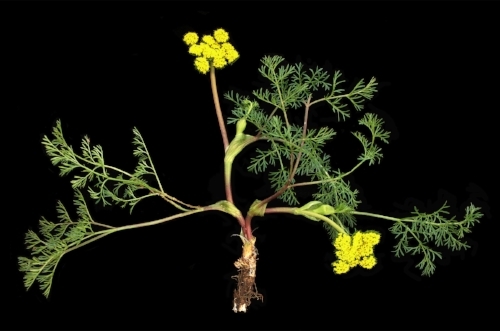 Alkali parsnip, L. caruifolium, has a similar inflorescence but has a naked stem. In the past when I read the annual Habitat Conservation Plan reports, L. utriculatum was always mentioned and every time my eyes saw those gorgeous lemon-yellow clusters, I immediately dropped to my knees and stroked the stem between my thumb and index finger. And every time I was disappointed to find that it had the naked stem of alkali parsnip. Imagine my excitement when, in a meadow below Radio Road, I finally found a leaf along the stem and my hunt for bladder parsnip was over. There seems to be an unwritten rule that as soon as you find a plant that has avoided you for 15 years, you will find more of them close by. Who knew that this meadow and an adjacent meadow were filled with them? The same storyline involved iris-leaved rush. There are two local rushes with flattened linear leaves that have cross walls; iris-leaved rush, Juncus xiphioides, and brown-headed rush, J. phaeocephalus. When you run your thumb and index finger along the blade you can feel slight bumps. Brown-headed rush is very common and is typically less than a foot tall with narrow leaves about 6mm wide. One Saturday in late June David and I were in Juncus Seep, which is next to the Terra Bay development on the South San Francisco side. We were walking up a creek that drains rainwater away from the nearby houses when I encountered a rather tall rush with long and very wide flattened leaves and large brown flowerheads. I immediately stroked a leaf and felt those cross walls; it was iris-leaved rush!! The leaves really resemble those of Douglas iris, Iris douglasiana, and are much larger and longer than those of brown-headed rush. Ranger Michele is our County Parks Natural Resource Specialist who happens to like the very small plants. She told us about a population of Oregon timwort, Cicendia, on a trail in Buckeye Canyon. It is indeed a very tiny plant about 2-3 cm tall with a very interesting bright yellow flower. It has 4 widely-ovate petals that form a perfect square about 6 mm wide. Is it no wonder that its species name is quadrangularis? You really must look hard for plants like these and it’s understandable that most people are charmed by the bigger, more obvious plants with spectacular inflorescences. But I think these little guys and gals deserve some respect, and they are fascinating. My mornings on the Mountain are always nice whether it’s sunny, foggy, or raining. There is always something to catch my eye or pique my curiosity. I find immense beauty in poison oak this time of year. What?!! It is around the 4th of July when poison oak decides to become a Chameleon and change color, not to hide or blend in, but to put on a show and shout, “Look at me! !” Those mottled dark-green leaves with splotches of burgundy to the blood-red leaves look ever-more intimidating against the deep green leaves of coffee berry, or mesmerizing when mixed in with bare grayish-brown naked branches of a dead coyote bush. poison oak in all it glory! 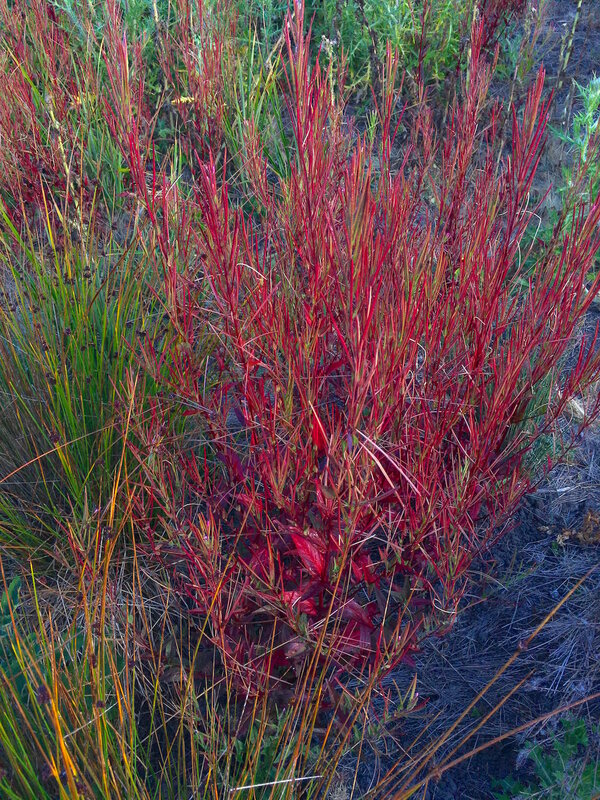 A seemingly nondescript solitary willow-herb becomes a statement when it forms a large patch of fiery-red sunlit plants. Its genus Epilobium is home to species with the common name fireweed. Discovering new or purported extirpated species is always gratifying, but when all is said and done, you never lose your appreciation for an old friend. You know that plant—the one that’s always there for you—to lift your spirits and make you feel happy.